I just want to start that I love the idea of a tribal war for a map, would really add enjoyment for me personally. I am wondering how the whole war zone thing will work for a state map though, especially if you are going to have territory bonuses. Do you think the tribal thing, especially the war zone, would work better with a more free form layout, sort of like Supermax? Oliver, I don't think there are many mountains in Florida . Impassables couls also be a forest. At the time of the tribal war, Florida was supposed to be almost virgin, so forests could be anywhere. 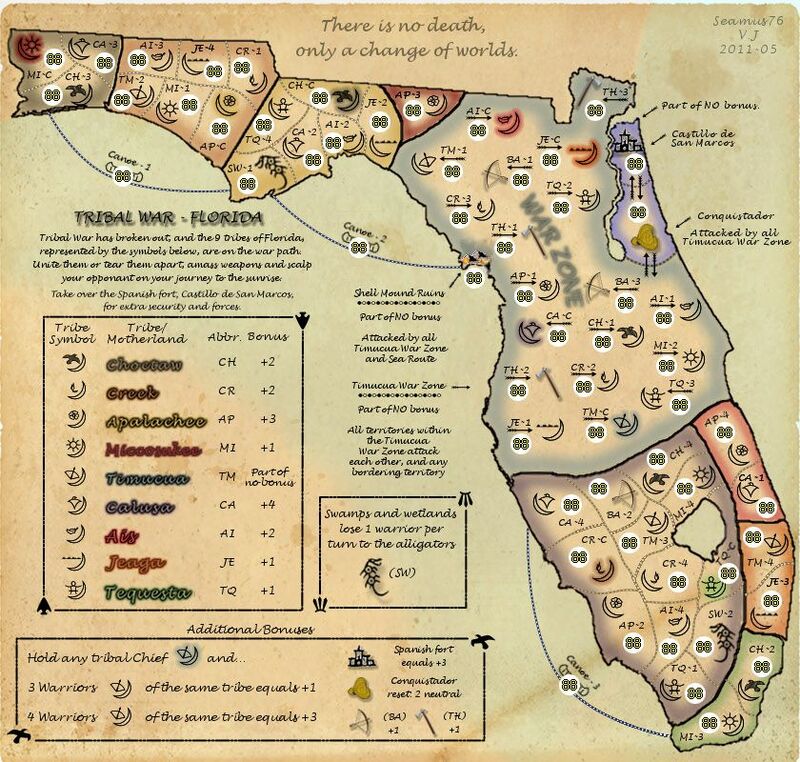 I suppose that this map is Florida because the tribes were supposed to live in that area. Well... sort of. OliverFA wrote: Impassables couls also be a forest. At the time of the tribal war, Florida was supposed to be almost virgin, so forests could be anywhere. Making forests impassable, at least in regard to the Theme of this map, doesn't seem logical. However, making Forests/Rivers/Swamps/etc, regions in their own-right, so that you have to 'spend time' traveling through or over these areas, could make more sense in terms of theme. Forest territories with 5-6 neutrals on them, serving as "impassables". That could work. Great idea for a map guys it's looking really good and can't wait to have a battle in the War Zone it will be proper mental! I find the symbols difficult to make out. Based on the feedback provided, we removed 1 warrior from each tribe, 9 total were taken away. This opened the War Zone up a bit, and once we get more into the graphics workshop we will certainly adjust the spacing of those territories to make it all fit right. We added the 3 canoes as actual territories which will start neutral, rather than just being pass throughs. Instead of making impassables we added 2 "Swaps", which start neutral, and lose one warrior per turn until there is only 1 left. They add two small adjustments to players strategies for getting through a region, or for getting from one end to another. They are also needed for a player to receive that regions bonus. The "Additional Bonuses" were adjusted from 5 warriors to 4 warriors needed for the +3 bonus. And the number of starting territories were adjusted to fit more with the new number of territories. 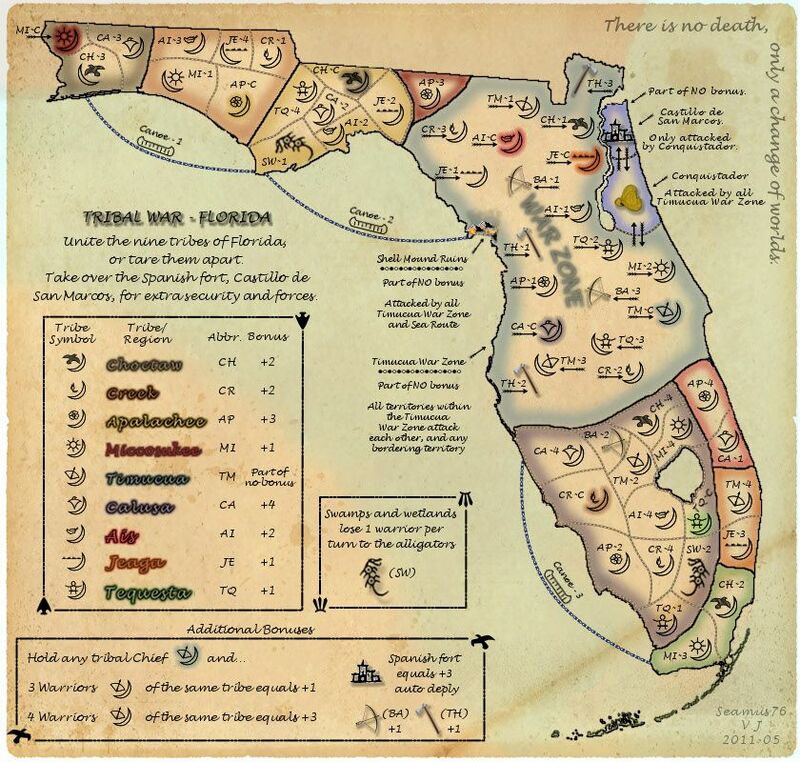 In order to meet the golden number of starting positions, one territory within the Timucua War Zone will be coded neutral. Last edited by Seamus76 on Tue May 10, 2011 6:14 pm, edited 1 time in total. 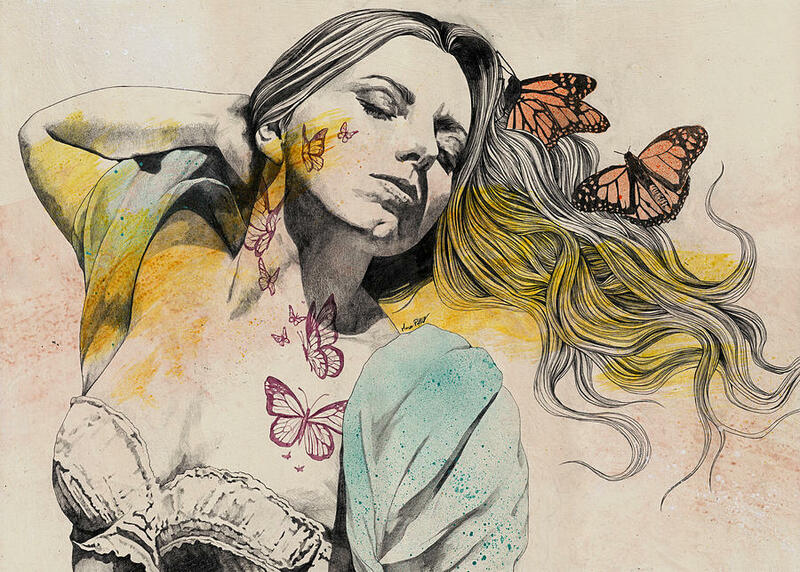 The magic number is not about overall territories, it's the number of starting territories that counts - ie. any territories that start neutral do not count. Thanks natty. All of the information has been adjusted to reflect the update. There are now 44 available starting territories. The 3 canoes will start neutral, and one territory, AP-3, will be coded neutral. Let me know if you have any other thoughts. One concern I just realized now. You should start thinking where you are going to place the army numbes. There is no place for army numbers in many territories, such as JE-4, CA-2, CA-1, TN-2 ... Why don't you try to place some fake numbers and see how it looks? there are too many four-way borders: these are places where four regions meet at a point, for example AP2, AI4, CRC and CR4, so that it's unclear whether the regions on opposite side can assault each other. adjust these so that only three regions border at any intersection. if the eight bonus zones are meant to represent the eight tribes, then why does each chief not live in his home area instead of elsewhere? the chiefs ought to start neutral (2 neutrals each) because of their importance to bonuses. try making a bow-and-arrrow different from a tomahawk, for example the bow-and-arrow bonus might be +2 for each chief held. in the legend, instead of tribe/region, call the bonus zones tribal domains or something similar that matches the theme. We adjusted the entire map size, which opened it up a bit more. We also redid all of the territory boarders and removed all of the four-way boarders, as well as included preliminary army numbers to give a better visual. I will comment more on the the territory placement, etc. shortly, but wanted to get v3.0 up for commenting. This is an interesting map. I really like the war zone, I think having a free range area is a pretty cool idea. I don't think you need to mention that only the conquistador can attack the Spanish fort, I think that's pretty clear. I almost wish there was a 2nd Spanish fort some where. Just having the one seems kind of lonely. The +3 is a pretty nice perk but it's tucked away in a corner that's pretty useless. Also do "warriors" refer to territories with a tribal symbol? that's a little unclear in the legend. If that's what that means maybe where it says "tribal symbol" in the legend should say "warrior symbol"
No wait, it doesn't does it? ok I'm a little confused as to the purpose of territories marked with a tribal symbol. Thanks everyone. I can try to clarify the game play on the map. Yes each symbol represents a tribe, but it may help to think about this with the Prison Riot map in mind. That is going to be the closest thing out there I think. 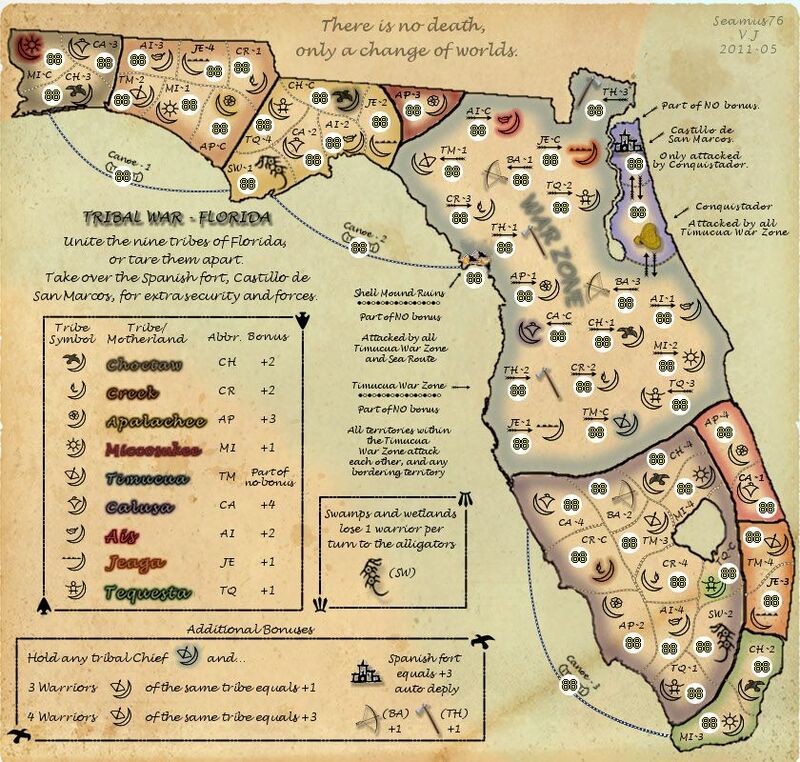 Basically the 9 tribes in Florida (the gangs), each has a Chief, much like the "gang leader". Instead of colors to represent the tribes (gangs), we have used symbols. Each symbol represents a different tribe. Will changing that wording make if more clear, I'm not sure it does, but I've been looking at this map for weeks so I know it's different from the outside in. There are 9 tribes, but only 8 bonus zones. The chiefs are spread out, and were basically assigned locations randomly, but if there needs to be a back story, they are out in battle with their warriors much like the chiefs would do. 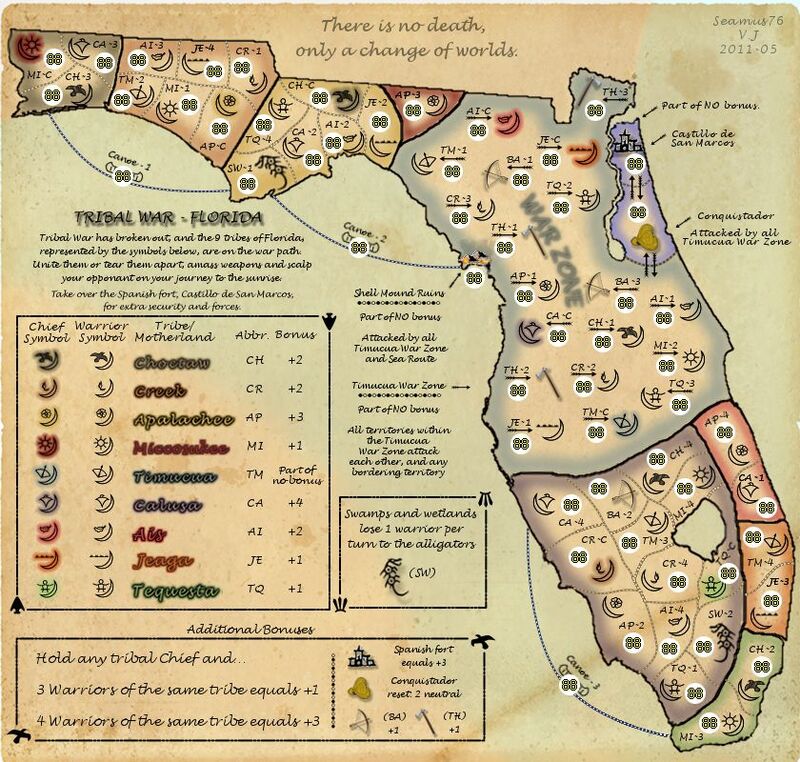 With the Miccosukee region being only one territory I wouldn't want to have that be a chief, but if that makes the most sense for playability, or makes for more strategic play I can deal with it. One thought might be to have all of the chiefs in the war zone, not starting neutral though. Then it would be harder to hold those bonuses, and make for more fierce competition. (For the fort) The +3 is a pretty nice perk but it's tucked away in a corner that's pretty useless. I think you're right, instead of an auto deploy, it would be better as just a +3 for holding the fort. That will make for even more competition and fighting if someone takes it. try making a bow-and-arrow different from a tomahawk, for example the bow-and-arrow bonus might be +2 for each chief held. For this we're just trying to keep it simple. Less is more. And, there is already a lot already going on with the symbols that we want to keep the textual descriptions and explanations as concise as we can. There's a typo in the legend: "tare" should be "tear". Fixed the grammatical error, and tried to give more clarity in the legend description. Changed the text to reflect the spanish fort being +3 instead of auto-deploy, and to start 3 neutral instead of 4 to make it more tempting. Also added the conquistador as resetting to +2 neutral. We think this is pretty cool. If anyone has feedback please let us know. We're hungry to keep this moving along. Yeah I have a suggestion. I think in the additional bonus legend it's confusing how you use a specific tribes symbol, and beyond that the only tribe with out a bonus region. That really threw me off until just now. I didn't realize that the bow and moon was just an example, and I thought that every tribe might have some of those floating around. I would just not include pictures in that section and change the words "Tribal symbol" in the main legend to "Warriors"
Updated both the main legend, and the Additional Bonus legend to help clarify the symbols and their bonus structures. We made some nice updates early this morning. Thoughts? Sorry I'm not being more specific, trust me that once the Memorial Day weekend is over I'll have some more concrete suggestions to give. The actual graphics look pretty smooth, btw, and this is an interesting historical presentation of a state. 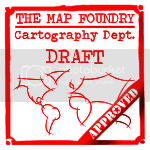 But I've promised to give attention to some other maps that have been waiting quite a while. If you can be patient with my vague thoughts for the next several days, I should be able to deliver a real critique. Is there a reason to make the boundaries of Florida have the same northern / western border as the State entity? It might be more with the theme if those border regions were a little less 'precise' and more amorphous.